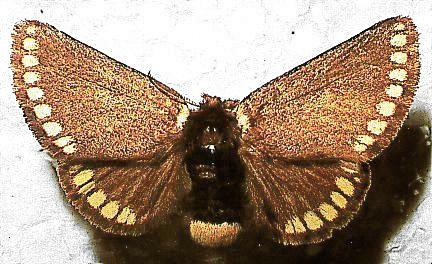 The wings of the adult female moths of this species are dark grey, each with a submarginal arc of pale spots. The forewings also have a lot of pale brown speckles concentrating near the bases. 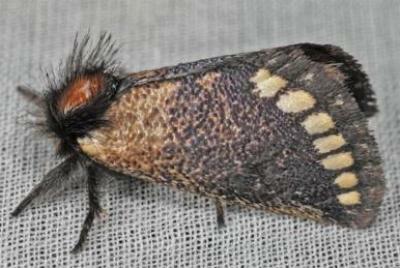 The abdomen is black, tipped with a bunch of golden hairs. The males are similar to the females except for the forewings, which are white each with a curvy dark submarginal line. Both sexes have a wingspan of about 4 cms. Series 2, Volume 4, Part 4 (1890), pp. 1088-1089. LeapFrogOz, Kuranda, 2015, pp. 177-178.